85, of Goodells, passed away on Monday, January 28, 2019, at Bluewater Hospice Home, Marysville. She was born in Detroit on May 22, 1933, to the late Peter and Theresa (Pioszak) Zakrzewski. Regina married her best friend, Joseph Reed Horner on May 25, 1968, in Detroit. Joseph passed away in 2007. She enjoyed spending her winters in Florida. She liked quilting, swimming, reading, and traveling. 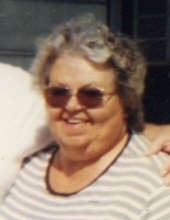 She is survived by her son, Joseph Paul Horner of Goodells; sisters, Paulinda (A. Michael) Deller of Livonia, Sylvia Reamer of Houghton Lake, and Elaine Deller of Clearwater Florida and many nieces, nephews and friends. The family honors the memory of Regina and invite you to visit and share memories Monday, February 4, 2019 from 2:00 to 8:00 p.m. at Kaatz Funeral Directors, Richmond, with rosary devotion/scripture services at 7:00 p.m. Rite of Christian Burial will be 10:30 a.m. Tuesday, February 5, 2019, at Our Lady of Mt. Carmel Catholic Church, Emmett, with 9:30 a.m. visiting. Fr. Brian Cokonougher, visiting pastor, will officiate. Memorials are suggested to “Wishes of the Family” or the Capuchin Soup Kitchen. To send flowers or a remembrance gift to the family of Regina Horner, please visit our Tribute Store. "Email Address" would like to share the life celebration of Regina Horner. Click on the "link" to go to share a favorite memory or leave a condolence message for the family.